I’ve been making ribs the exact same way for many years, but when I read this recipe, I predicted they would be spectacular. Indeed, my expectations were spot on. If you are also very partial to a particular tried-and-true recipe for barbecued ribs, please try this version: they are sticky, sweet, spicy, juicy, tender, you and your guests will leave only a pile of very clean rib bones on the plate! Mix the rosemary, 2 tablespoons of the brown sugar, 2 tablespoons balsamic vinegar plus the cayenne pepper in a small bowl. Mince the garlic, add 1 teaspoon of salt to it and mash with the side of a large knife to form a paste. Add it to the marinade with 1/2 tablespoon of kosher salt and 1/2 teaspoon pepper & mix all the ingredients together. Rub evenly over the ribs and place in a baking dish. Marinate, chilled, for 8-24 hours. Preheat the oven to 350 F. Arrange the ribs in a large roasting pan and pour 1/2 cup water inside, under the ribs. Cover tightly with foil, and bake the ribs until the meat is very tender, about 2 and a half hours. Remove from the oven and transfer the ribs to a platter. Add 1 cup of water to the pan, and using a wooden spoon, scrape up all the browned bits. Strain the liquid into a measuring cup, or gravy separator to remove the excess fat. Transfer to a skillet and add 1/2 cup balsamic vinegar and 1/4 cup brown sugar. Bring the mixture to a boil and simmer gently until reduced to about 1 cup, 15 to 20 minutes. Heat the grill. Brush some glaze over both sides of the ribs and grill, turning occasionally, until the ribs are hot and with nice grill marks all over, 6 to 8 minutes. Brush the ribs with some more glaze and serve. Comments: This is a perfect recipe for the heat wave we’re going through (111 F last week in Manhattan, 106 F this week in Norman), because the initial baking happens at a reasonably low temperature. Plus, you can do that step very early in the morning, even a couple of days ahead of your party. Remove the ribs from the fridge an hour or so before dinner, turn the grill on, and assemble a few side dishes. In less than 10 minutes you will be ready to enjoy THE most amazing ribs ever! The balsamic glaze is a nice change from the usual barbecue sauce. I can see it complementing a thick piece of grilled salmon quite well. Need the perfect dessert for the 4th? Try my beloved’s husband patriotic pie! Sounds like a great recipe. I had a turkey drumstick for supper … with spicy bbq sauce. Not quite as special as your ribs but still, tasty enough. 🙂 As a fellow Canadian, happy belated Canada Day. Now THAT’s something that intimidates me: turkey drumstick – I’ve seen it for sale in grocery stores, never had the courage to bring a couple home to cook. Sounds tasty, though…. These not only sounds delicious, they look gorgeous! 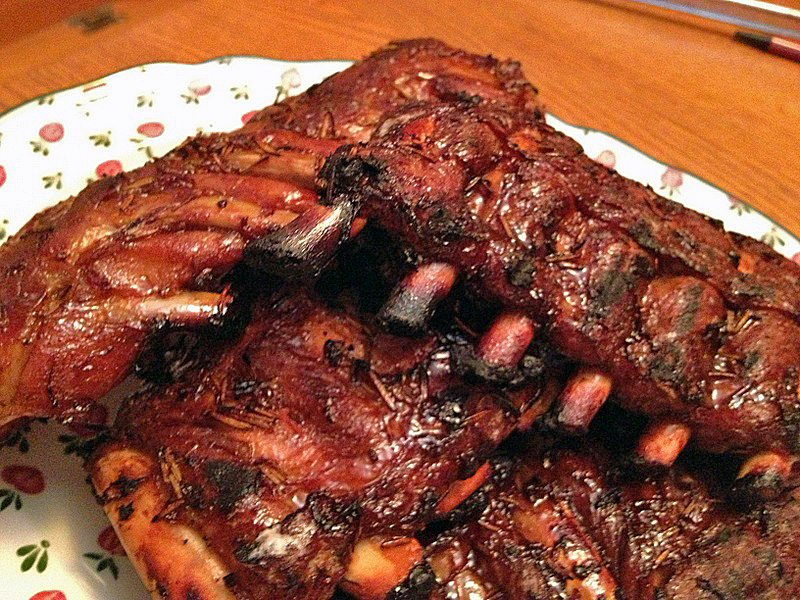 (a sticky, yummy mess – just the way ribs ought to be! :)). I especially like the rosemary in this recipe… does it come through with the other flavourings? Happy Holidays Sally! I hope all is going smoothly with your move. The rosemary does come through, but not too strongly – I guess you could add a little more without problems…. You know our love affair with balsamic! This sounds fabulous. We’re smoking ribs this weekend. I think I’ll share this marinade recipe with Mike. It just sounds delicious. And we’re having salmon tomorrow…oh the possibilities! If our grill was not in Manhattan we would be making a nice grilled salmon tonight. Instead, we might have to go out for dinner, as it’s soooo hot to cook inside an empty home! Katie always has such great recipes and I trust her foodie tastes implicitly! I’m so glad these were a success! What do you do if you aren’t somewhere where you have a grill to finish the ribs. Is there an alternative to finishing them in the oven or is the taste just not the same?? These do look delicious! I usually do my “tried and true” recipe as well, but I would be totally willing to try these! 🙂 Hope the unpacking is going well and you guys are getting all settled in!